Once your mindset is right, it’s time to think about how you’re going to build your traffic and audience over the long term. Strategy won’t necessarily be a direct contributor to your traffic numbers, but it will help you to stay consistent and build towards your goals. Blogging without a goal is a lot like driving blind. You’re moving towards something, but you have no idea what. This is why tactics are secondary to strategy. If you’ve taken the time to plan how you’re going to build towards your objectives, the tactics you employ will be far more focused and therefore effective. Let’s move onto the tips in this chapter. This point often gets talked about, but isn’t always given enough attention by aspiring bloggers. Identifying your audience will help you to understand who you’re trying to appeal to, what they are likely to be interested in, and how to capture their attention. This isn’t necessarily a scientific process. You can study other blogs, read comments, or go to forums to gather more information about your audience. Create three to four target profiles for the type of people that are likely to read your blog. Your target profiles can be completely fictional people, but as you begin to think about whom they are, where they hang out, what their needs are and what problems they have, you will find this process tremendously enlightening. When I went through this exercise, I discovered that I could relate my target profiles to real people I already knew. That helped me get a much better sense of where to connect with people like them. At some point, you’re going to have to give some consideration to how you can differentiate yourself. There’s no way to do that without taking a closer look at the competition to study what they’re doing. Your goal is to build an awareness of the gaps and missing pieces in their strategies so that you can develop your own unique voice. Of course, studying your competition is to no avail if you don’t actually take the steps necessary to stand out. Perhaps your competition isn’t using pictures on their blog. Or maybe they’re not writing long-form content. Or maybe there’s something unique to your experience that’s not getting covered elsewhere. Whatever the case, begin testing different approaches, and make changes as you go. Go directly to the people that you think would be interested in your content and ask questions. Get to know people on forums, survey them, or even go for coffee and interview prospects on a local level. This should give you a better idea of what the demand is like for a blog like yours. Trust me; when you interact with your market on a regular basis, you start to pick up on the language they use and how they describe their problems; and that’s exactly what you want. Assuming that you’ve talked to your target market and you have a pretty good sense of what problems they have, you should be able to build your content schedule based on the questions that need to be answered and the problems that need to be solved. Though having a content schedule won’t instantaneously build your traffic, it will help you to keep a pulse on what you need to talk about on your blog. Even if you are armed with the best possible information, it doesn’t necessarily mean that your blog posts will take off all on their own. Be open to experimentation. Try different lengths, use different sizes of images, or write different kinds of posts. You never know when something might go viral. Not everything works for everyone. Some things will likely work better for you than others. Opportunity often comes from the people that know, like and trust you. Whether in the online world or offline world, you can expect the best referrals and prospects to come from people you know. In short, build new connections everywhere you go, and be prepared to serve people. Be a friend so that others will also befriend you. Word-of-mouth marketing is powerful, but if all you do is sit at your desk and type all day, you’re probably not going to meet a lot of people. I’ve been teaching guitar for over 10 years, and I’ve had hundreds – if not over a thousand – students. Not that all of them are, or even would be, interested in what I’m doing, but occasionally I run across one who is. You just never know when and where you might meet someone that will have a positive impact on your project. If you are a brand new blogger, it is quite unlikely that you will have found your voice as a writer. You will have to invest considerable amount of time into your craft to really find your approach. It’s a lot like learning to play an instrument. You won’t be great at it at first, but if you keep practicing, you will get better. So keep at it. Blogging is a lot like writing a book, with the main difference being that it’s a lot easier to do (I should know; I have been working on my book since 2012). Books usually drive a few key points home. Yes, they go into a lot of detail, but more often than not the book can be boiled down to a few simple principles. So, ask yourself: what is my message? Figure out what it is. I think this is more about keeping yourself accountable than it is keeping accountable to others. Once you start getting avid followers, they will definitely be going after you if you miss a day, but in the beginning, it usually isn’t like that. Treat your blog like a business or a TV show or a radio show. Put something out every month, every two weeks, every week, or every day at a set time, regardless of whether you feel like it, whether it’s convenient, whether it makes sense to do so or not. But the thing is that when you keep showing up, your audience feels like you care. If at some point you decide to start making products for your blog, and you stop blogging altogether during product development, you also stop the flow of the pump you’ve been pumping. It isn’t always easy, but if you stay persistent, it will keep your readers engaged. 19. Brainstorm New Ideas – Constantly! If you’re a blogger, then you need a steady stream of ideas for posts, headlines, keywords, marketing strategies, and so on. This doesn’t just happen on autopilot. Entrepreneur James Altucher has a practice where he generates at least 10 new ideas every single day. I’ve been doing the same thing for several months now, and not all of the ideas have been great, and I certainly haven’t used all of them, but many of them have benefited me, and I have found that the habit is worth developing. Working alone is a trap for most solo bloggers and entrepreneurs. Sure, writing is almost always done in solitude, but this doesn’t mean that you can’t leverage the strengths of others. Look for ways to include others and take advantage of their talents. Delegate. Outsource. Collaborate. Share Ideas. Don’t just give others the short end of the deal, but if you’re not tapping into your network, you’re not being as effective as you could be. Do you know someone that’s also a blogger? Could you strike up a partnership with them? Would they be willing to share your content in exchange for your social shares? Young entrepreneur Glen Allsopp of ViperChill once documented the effect of this exact tactic, and the by-product was both blogs grew together; at a much faster rate than if they didn’t have that partnership. You can have as many partnerships as you want, but you don’t necessarily need many. Obviously it helps if they are in a similar niche to yours. As a blogger, you might have a myriad of different interests. You may even have a compulsion to write about all of them. However, whatever your topic is, it’s important to deliver the type of content your audience is expecting. Easier said than done? Of course. But you could always start a personal blog for all of the other stuff you want to talk about. 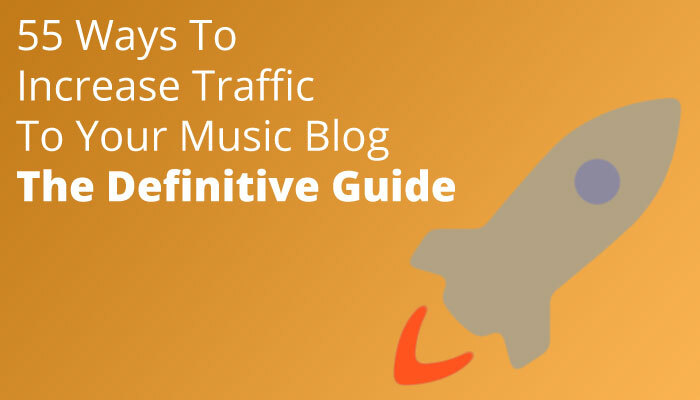 That way you’ll stop yourself from getting off-track on your music blog. Many people build lasting friendships and relationships on forums and online communities. Some of them even get married. I can’t even comprehend that. The idea here is to contribute to the community. Blatant self-promotion should only be done in moderation. Of course, you can still use your user profile and signature to maximum effect. Aimless stat-gazing won’t accomplish anything. However, analytics can be useful if you know what to look for. For example, you can check your top ranking posts to get an idea of what people are interested in on your blog. You can then create more content like that. You could also prioritize email opt-in offers on your top ranking pages. Make it a point to study your stats occasionally to make adjustments to your strategy. I’ve already talked about the importance of building connections and meeting new people. Conferences are great places to make new connections, especially if they are relevant to your niche. Of course, if you are a featured speaker, you can expect your impact to be even greater. Notwithstanding, great partnerships and opportunities can come from attending conferences.